Choosing the right pet for you and your family is something we take very seriously. Treating our customers the way we would want to be treated is very important to us and we want all of our customers to know we care about each new pet placement. We hope that you research hedgehogs as pets and understand their needs and what to expect from them before making your purchase. 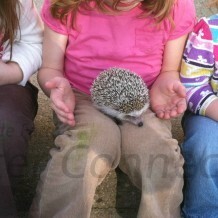 It is hard to understand the prickliness of a hedgehog without actually holding one. Meeting a little critter in person before your purchase is definitely recommended if at all possible before actually making a purchase. We often have requests for people to come and “check-out” our animals before putting down a deposit or making a purchase and we are more than happy to accommodate those requests. Hedgehogs are still considered exotic pets and are relatively hard to find. Local zoos, animal educators, nature museums or children’s museums might be options to visit one locally if traveling to us is not an option. Again, we welcome pre-purchase visits. In return, we ask that you respect our time, energy, and talents with your visit. When you visit we will treat you just like a purchasing customer and do our best to answer all of your questions, allow you to handle our babies, and share our passion with you. You must schedule An Educational Visit to our farm rather than simply showing up for a visit. We cannot guarantee that we will be available without an appointment. Farm life with a home-based business and five active children makes for some crazy times and we want to be able to give you our full attention. We do ask for $25 that will be applied to the price of your hedgehog if you choose to purchase one. We believe you will find that the educational and handling experience plus a view of the farm will be well worth your visit. The simplest way to come visit our hedgehogs is to schedule a visit while another customer is purchasing a hedgehog. When checking on setting up a time for your visit, please let us know if you think you might want to purchase the same day (so we can make sure your potential pet is available). Most likely your appointment will be the last appointment on a Saturday or sometime during the week when another customer is scheduled. Please keep in mind you will have to be flexible with scheduling visits without a purchasing commitment than with a purchasing commitment. Even if we do not have babies available for sale, there are times when we can still allow you to see what babies are like and you can purchase a future date. We cannot guarantee availability of a hedgehog to take home the same day without a deposit on an animal. We do our best to keep our Available Animals page updated but we receive deposits on a daily basis so our availability is constantly changing. Unfortunately, we have had visitors who took advantage of our time and resources with no real intentions of purchasing a pet from us. Operating Millermeade Farms is our career and educating customers about hedgehogs is part of our profession. In order to protect our family and our business we now require a $25 deposit to “visit” the farm that is to be paid in advance. By handling a couple different hedgehogs you can make a more educated decision on the perfect pet for you. Should you decide to purchase a pet from us, the $25 will be deducted from the price of your animal. Should you decide that one of our pets is NOT right for you, you have simply invested $25 into your potential pet knowledge and hopefully had a great up-close and personal experience with some strange animals. Again, we cannot guarantee availability of a hedgehog to take home the same day without a deposit on an animal. We do our best to keep our Available Animals page updated but we receive deposits on a daily basis so our availability is constantly changing.